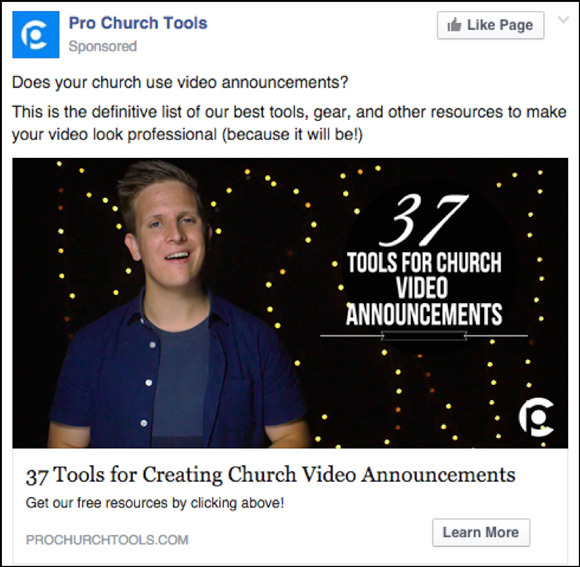 In 6 months, Brady Shearer of Pro Church Tools was able to take a new educational product — geared towards helping churches navigate the tricky world of digital media — and generate $25,865 in recurring monthly revenue. He did this using 4 conversion funnels with different offers to promote this new continuity offer, Pro Church Academy, and his other products. By carefully setting expectations with every point of contact, the funnels quickly converted cold traffic into customers. Total Academy Monthly Recurring Revenue: $25,865/mo. We’ll dive into all 4 of the funnels in just a minute, but first let’s look at the foundation of this entire campaign. However, the beauty of this system is that you don’t have to have every piece of the puzzle in place to see success. For the sake of this case study, we’ll be breaking down how we generated $25,865 in recurring monthly revenue using just steps 1-4. Even better — this technique is incredibly effective when combined with a paid traffic strategy to acquire leads. A strong Lead Magnet is the core of this strategy. You need to create an offer that is attractive to your ideal customer and sets the expectations for the rest of the funnel. You want to tap into a desire of your customer that you can build on. The Lead Magnet should solve a small part of a big problem. Brady understood the problem many churches face: In order to attract younger generations and remain relevant, churches need to use the same channels that businesses and other organizations are using to reach their audiences. They need a strong online presence. Brady designed four Lead Magnets that offered a small solution to this big problem churches had. These are similar enough that they are all relevant to the target audience, but different enough that they cover a broad range of solutions. This gave visitors multiple opportunities to convert. If they opted into one Lead Magnet, but did not convert on the upsell the first time, the other Lead Magnets were out there to give them another opportunity to convert into a paying customer. 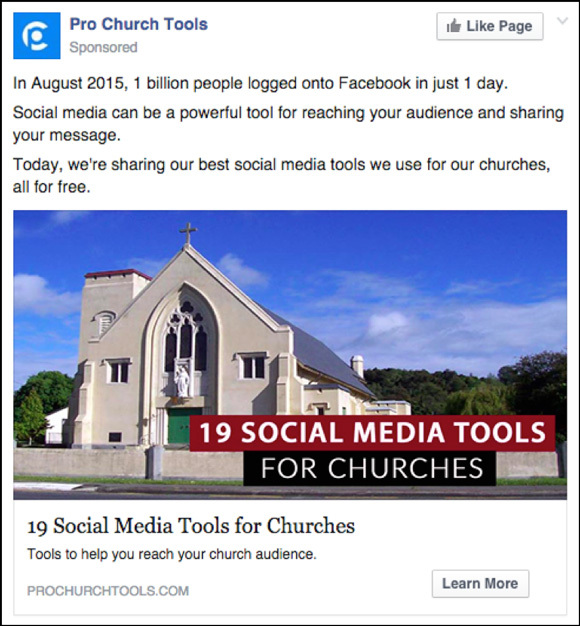 The Lead Magnets primarily targeted cold traffic — people who had never visited Pro Church Tools before. Ready to check out the first funnel? Let’s get into it. In their first funnel, the Lead Magnet’s ad creative featured a simple black leather texture with gold lettering to borrow from familiarity of common designs of bibles and hymns that their target audience could relate to. The copy fully describes what the visitor will get if they download, and reassures them that this process will work, even if they’re not a designer. The other important asset is the video included walking the visitor through the process of creating the graphics. This sets an early expectation for the visitor and they opt-in looking forward to a video. If they opted-in, they were taken to a Thank You page that presented a Tripwire offer. Thank You pages are often underutilized real estate in funnels. But they are also one of the most valuable pages in your funnel. The only people who see Thank You pages are people who have already taken action. It’s traffic that’s ripe for more conversions. A Tripwire is an absolutely irresistable offer that has one objective: acquiring customers. Like Ryan Deiss has explained, a Tripwire is a delicate part of the funnel because it is the first time you’re asking the visitor to make a purchase — even if it’s just $1, the relationship changes from prospect to customer. It’s important that your Tripwire offer is closely aligned with the original Lead Magnet. This funnel’s Thank You page presented a $7 offer for 3 graphic templates. The templates would make it easier for the visitor to use the guide they just downloaded and provided a lot of additional value at a low-price point. The Tripwire offer is introduced as part of the video explaining the process of creating great church graphics. This subtly builds the desire of the visitor. They are simultaneously being educated and being upsold on the Tripwire offer. The call-to-action (CTA) and additional information about the templates does not appear until Brady has introduced the offer and has established it as a key part in the graphics creation process. Friction makes it harder for the visitor to convert. Adding friction at this stage may seem like the last thing you want to do, with a visitor that has just converted and is ready to purchase. If the button had appeared earlier, the visitor may have scrolled down and seen the offer for the templates before watching the video. They may have been less likely to convert since they had not seen the video and been primed on the process that Brady outlines. This same strategy is repeated if visitors convert on the Tripwire offer. The low-dollar Tripwire offer is not meant to be profitable. The goal of the Tripwire is to warm a visitor up to making purchases and make it easier to sell a high-dollar offer. They have now made a purchase and have indicated that they value church graphics and are willing to pay for them. 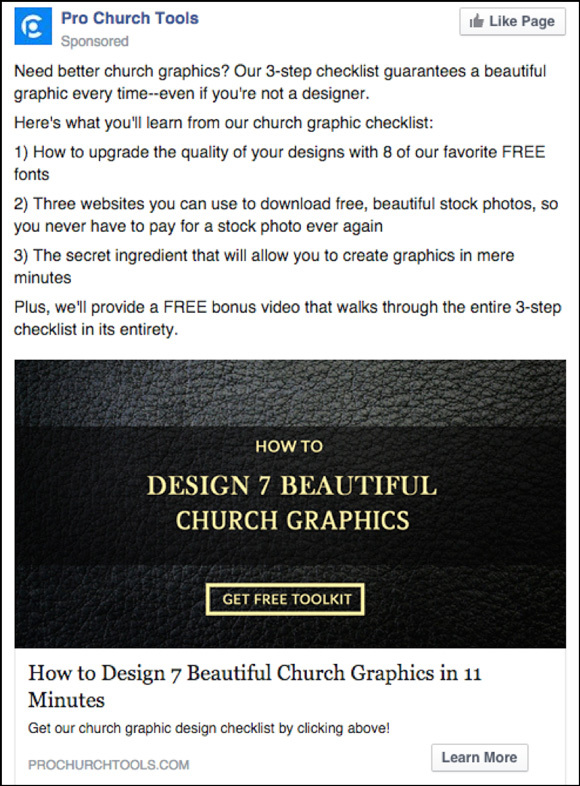 After the Tripwire purchase, they are taken to another Thank You page that offers a $199 church graphics handbook. Again, they see a video that talks about templates and introduces the church graphics handbook. This targets a different aspect of the challenge that churches face when trying to stay relevant to younger generations. 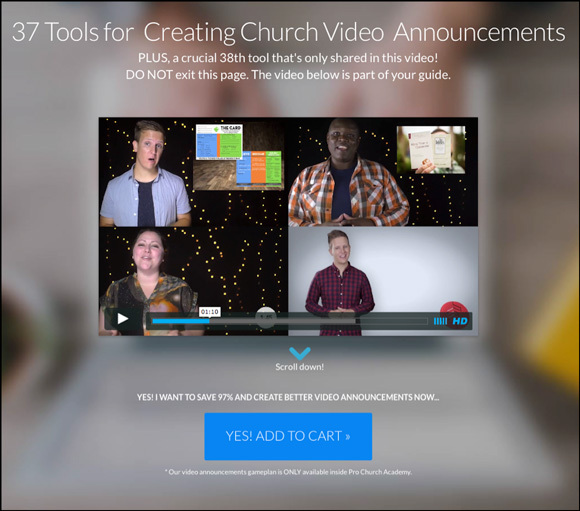 Video announcements are a common tool churches use to communicate with their congregations — but they are competing in a space with Vine and YouTube, so to be effective they need to look good. This Lead Magnet offers 37 tools to create professional video announcements. The ad calls out the target audience with a question and displays an image with Brady and his trademark backdrop that he uses in most of his videos. The Thank You page explains the 37 tools for creating visitor announcements. Halfway through the video, Brady mentions a 38th tool that is crucial to successfully use the rest of the offer. 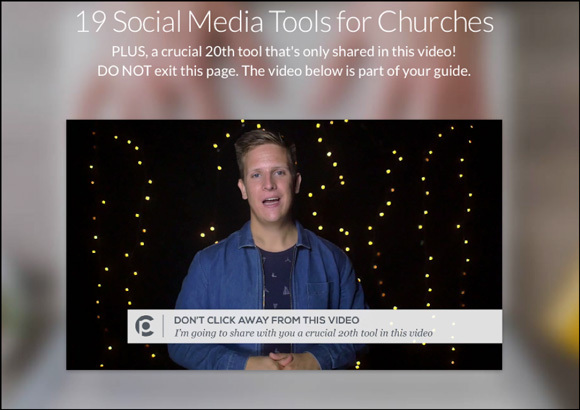 Brady establishes the high value of this 38th tool: you can’t find training like this for churches anywhere else and it includes over 84 minutes of lessons that will help people create the video announcements from scratch. Once the tool is presented, Brady mentions that it is only for members of Pro Church Academy, and establishes the exclusivity of this membership by saying it’s only open for enrollment twice a year. They offer the 38th tool for $1 and include a free trial membership to Pro Church Academy (normally $35/mo). This 1-2 punch of high-value and exclusivity makes the $1 offer difficult to resist. The goal is to make it very easy for a customer to opt-in to a recurring product. This drives high-value over time for Pro Church Tools, if the customer stays in the community for the long-term. After 14 days, they are automatically switched over to the $35/month standard membership. Driving new members into the community also provides more value for the current members. 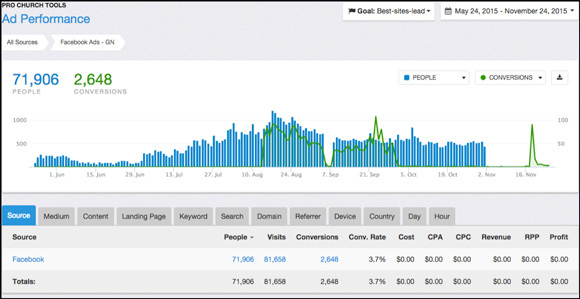 Growth is the lifeblood of online communities and this funnel system creates a predictable way to grow the community. Access your ‘How to Set Up a Continuity Offer’ Office Hours call in DigitalMarketer Lab. Learn all you need to know about Google Tag Manager and Pixel Targeting. This third Lead Magnet again takes a slightly different angle on the same broad problem Pro Church Tools solves. 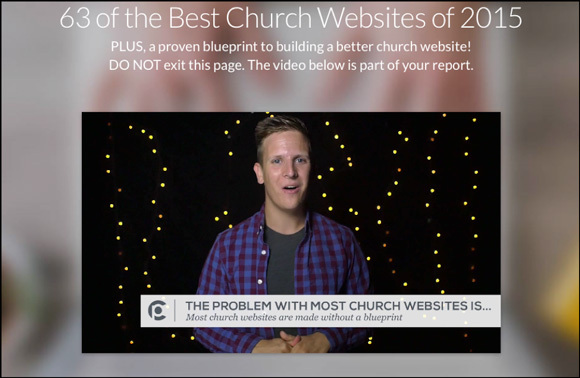 If a church wants to stay relevant, it needs to have a good website. Most pastors and other ministers are not naturally talented web designers and find it challenging to know where to start on a website. This ad targets that pain point directly and gives a statistic to support the idea that if you don’t have a good website, you may be discredited. The Lead Magnet offers a solution by providing a list of sites with great designs that the visitor can study and mentions a bonus video. A converted visitor is taken to the Thank You page where Brady introduces the 63 best church designs and mentions that the common thread between all of these churches is that they had a plan. He again plays on the pain that most churches don’t know what they are doing and make many mistakes when building a website. He then introduces his church blueprint tool as the solution to this problem and offers it for $1 with a trial membership to Pro Church Academy. At this point, the CTA button and the rest of the landing page become visible to support the new offer. Similar to funnel 2, he builds on a pain point from the first ad through every interaction with the visitor and presents a total solution as an irresistible $1 offer. 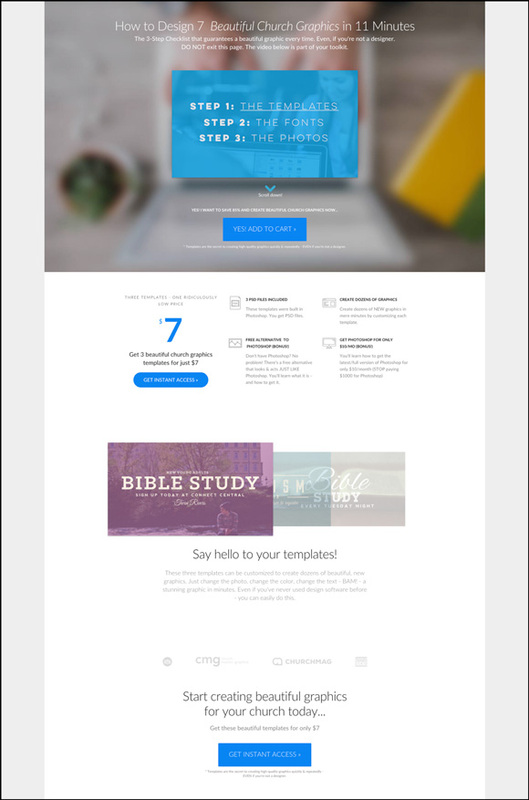 Though it is only a dollar, it funnels members into Pro Church Academy, which is a high-profit recurring product — and the Core Offer. The fourth funnel opens with a Lead Magnet that helps churches reach their audience on social media. Most church ministries are intimidated by social media and aren’t sure how to approach it. This offer opens with a statistic to add credibility, then presents the opportunities possible with social media. The ad reassures the visitor with “all for free,” so they know that these tools won’t break their budget. Converted visitors are taken to a Thank You page with a video that lets them know their tools list is on the way. 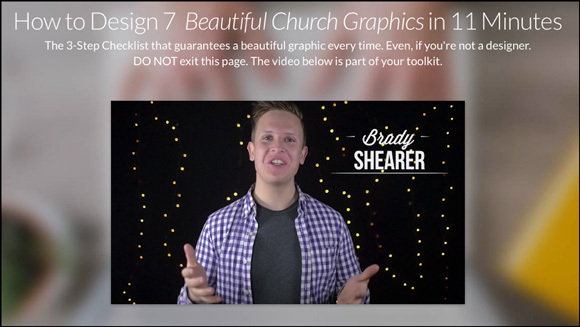 Brady builds credibility by letting the visitor know that they use all of these tools with their churches. He encourages the visitor not to click away, announces a 20th tool and explains that the list of 19 tools is incomplete without the 20th. The 20th tool is a social media strategy that will provide a framework to use the tools outlined in the lead magnet offer. The strategy is based on Saddleback Church’s social media strategy, which is well-known for their successes in reaching their audience online, particularly with social media. Tying this offer to Saddleback Church builds credibility and demonstrates results that the visitor relate to and even look up, if they need additional social proof. He presents his social media strategy and mentions there’s no training on social media specifically for churches and that tools alone won’t solve the problem. He again presents his strategy as an irresistible offer for just $1 and includes a trial membership to Pro Church Academy. Each of these funnels targeted a specific branch of a broad problem that most churches are having. 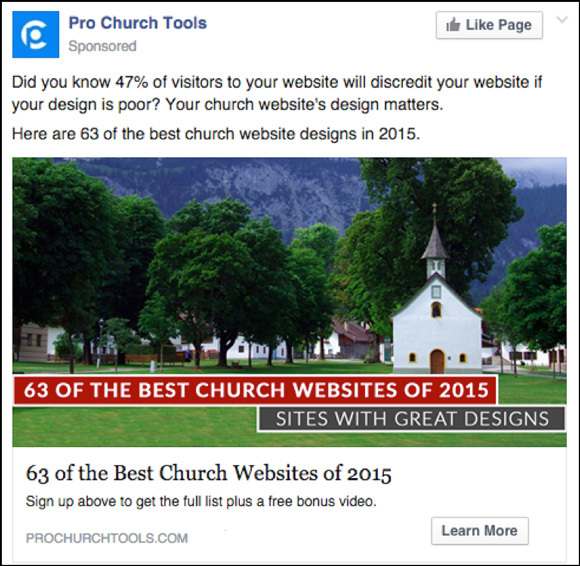 This ensured that Pro Church Tools always had a relevant offer to their audience and maximized the chances of getting visitors into a funnel. He used copy to set the expectations of the visitor, so they were expecting the videos that he used to introduce his upsell product. This kept visitors engaged; they wanted to see the videos. The delayed appearance of the CTA button and upsell offer on the Thank You page allowed time for the video to build desire in the visitor before they were even aware that they were being presented with another offer. These funnels were a huge win for Pro Church Tools. You can use these same techniques to build desire and generate recurring revenue for your business as well. Kyle Gray is the founder of Conversion Cake a service that helps small businesses and startups implement successful content marketing campaigns with hands-on training and easy to use templates. Connect with Kyle on Twitter.